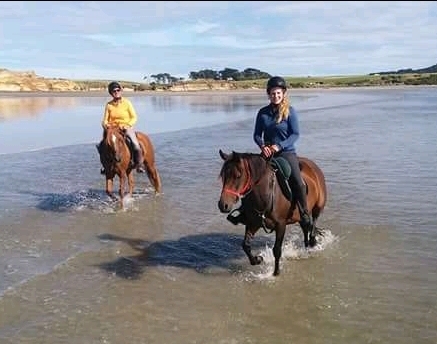 Personalised beach, farm and bush rides. 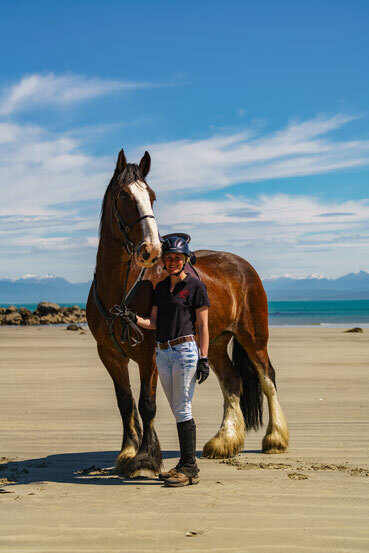 We’ve had Dodge since he was a foal, just one year after Elfi moved to New Zealand. He loves cuddles and scratches, so don’t be surprised when you enter the paddock and this big boy is standing right beside you asking for some love. Our gentle giant is always relaxed and easy-going. 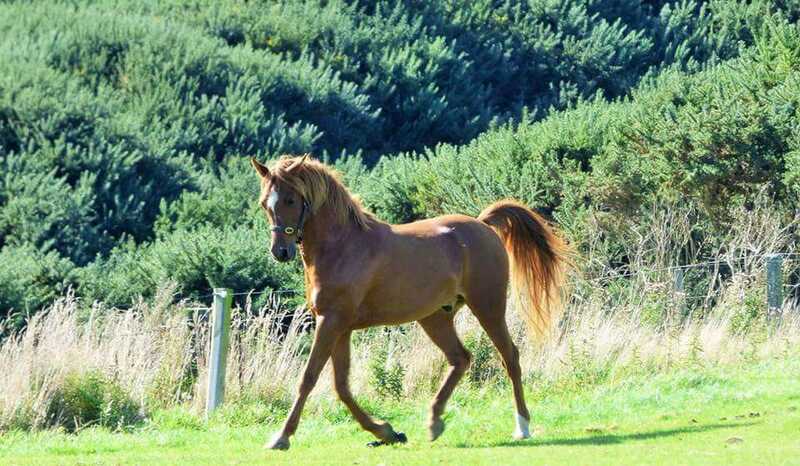 But once you have the chance to canter on him, you can feel his super powerful movements. So impressive! 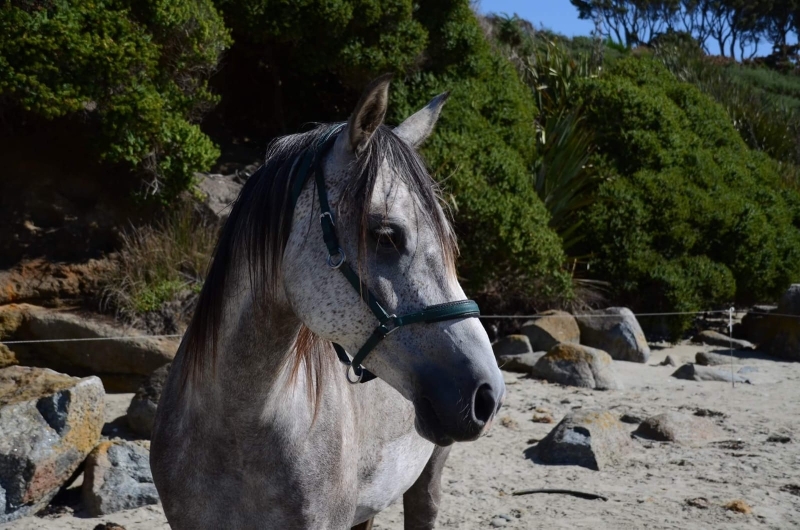 Flicka has successfully proven her fitness several times on endurance rides with Elfi. This sensitive mare would never let her rider down. Although she is a very forward horse, she really takes care when a kid is sitting on her back. This beautiful young mare is just in the process of getting started under the saddle. Very curious and friendly she’s discovering the world and always keen on accompanying the other horses on rides over the farm and along the beach. After being retired from his career as a race horse, Hasti is just enjoying his life with us. He’s the boss of the herd, but never bossy to his rider. And he’s carrying you even on longer treks without any effort. 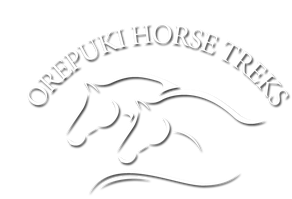 Little Jackson is on his way to become the perfect trekking horse for everyone. Despite the fact that he’s one of the youngest, he’s already a safe horse which gets more and more confident and is a pleasure to ride. Our cheeky boy is very playful, so watch your clothes – they might not be safe with him. But under the saddle you don’t need to worry about anything, because you’ve got a very reliable forward horse, which is really fun. The name says it all: Champ is originally called “Sure to be Secure” and you couldn’t imagine a safer horse than him. Beginners as well as experienced riders enjoy riding our Quarter Horse and the kids even have fun vaulting on him. Please e-mail or text us for bookings. Please note that we do not have EFTPOS or credit card facilities.